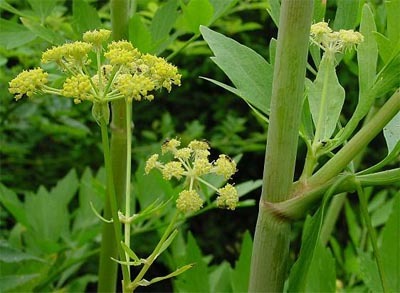 Medicinal uses: Dried rhizomes and roots used as diuretic to treat edema, inflammations of the lower urinary tract, and to prevent kidney gravel. A warming and tonic herb improves poor circulation. Traditionally taken to improve digestion and as expectorant and emmenagogue. Also used as a spice and in liqueurs (Chevallier 227). Additional uses: The leaves, stems and seeds all taste similar to celery. The leaves and stems can be used fresh or dried any way that celery is used (Kowalchik 369). Cautions: Do not take during pregnancy, or if you suffer from kidney disease (Chevallier 227).